The forex market is usually a volatile one. It is ever full of uncertainties, and unsure of any day’s liquidity; hence the need for highly competitive, reliable and stable brokers. 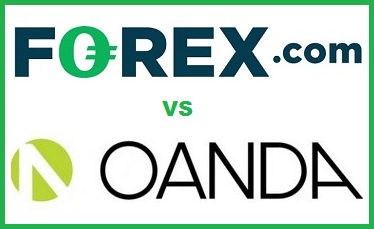 Here is a comparison between two of the forex industry ’s big names, Forex.com and OANDA. This analysis is to show how they stand against each other when it comes to features such as their spreads and fee, trading platform and security. Regulated by NFA and CFTC USA, FCA UK, ASIC, IIROC, FSA Japan. It is under the regulation of various entities including CFTC, and FCA and ASIC. It charges $ 5 of commission per each standard lot of 100,000. But it also charges a low variable spread, carried out at the time of trade execution. An inactivity fees is charged for accounts with less than $ 10,000 in their balance. There is a hybrid pricing which is a combination of core and commission charged at $5 per 100,000 base currency traded. It does not charge any added commissions. A charge of 10 units is charged against an account that is inactive for over 12 months. Currently allows trading in 84 currencies. Trades in cryptocurrencies including Bitcoin, Ethereum, Litecoin, and Ripple. Commodity options include Gold, silver, Platinum, cotton, corn, Heating oil palladium, silver among many others. Its commodity options include natural gas, corn, crude oil, gold, copper, silver, soybeans, sugar, and wheat. Offers multiple trading platforms including desktop, web and mobile trading. Along with advanced trading features, the desktop trading platform is also accompanied with superior analytical tools and an integration of great trading strategies. Also offer multiple and advanced trading platforms such as the desktop, mobile and web trading platforms. Just like Forex.com, it offers MetaTrader 4 platform. Forex.com has an additional regulator in the form of Financial Services Authority (Japan), as well as Cayman Islands Monetary Authority (CIMA). Also, its operating funds are kept separate from all customer deposits to avoid any compromises and complications. Offers protection of clients’ funds up to £50,000 in the UK; in Canada, protection for clients’ funds goes up to CAD $1 million. When it comes to other countries this kind of protection is non-available. Forex.com research: Its variety of trading platforms comes with all kinds of research content including real-time news and advanced charting, Again, users can access live trading webinars, and technical research and economic analysis resources. OANDA Research: Users can access Market Pulse, which is a site that disseminates information on news and analysis of the forex market, and global economic calendar, which is used to predict macroeconomic trends. Offers their customers phone support 24/7. There is live chat and email service is also available 24 /7. Customer support readily available 24/7 mostly via email. Live chat is available only on specific days in a week. Both Forex.com and OANDA are tying when it comes to their impeccable customer support and resources for research. Again, the fact that they support multiple platforms is a big plus for both of them. Also, they both offer the industry’s standard MT4 trading platform. However, when it comes to matters of currency offering, Forex.com beats OANDA hands down. It basically has to do with Forex ’s large number of currency dealings as well as its support for cryptocurrency. With such a tiny margin separating the two giants, it all boils down to how comfortable you are with either of them.